Can you make Easter theme fairy house? ehm...I scratched my head and said "YES!" I quickly pull out my sketch book and start making rough sketches with notes: Easter, yellow, chocolate, bunny with carrots and that's it! You may ask, "where is the door? fairy house must come with fairy door!" ..ehm really? Alright! can we remove the fairy door because fairy has an open house for Easter celebration..ha...ha...isn't it interesting to play with our imagination? Honestly, I don't think there is certain design guide to make fairy house. Nothing can limit our creation, right? 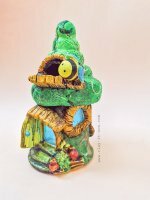 So here it is I am sharing my fairy house with yellow mushroom roof, no door and bunny playing on top of its roof sliding through splashing of dark chocolate..ha..ha..
Let's make the craft together. First of all, gather your supplies. You need jar, aluminium foil, hot glue gun, tissue roll, white glue, water, acrylic paint, paint brush and air dry clay. You can use homemade clay or buy ready-made clay from store/ online. If you want to buy the clay, please check out my page, what clay to buy if you are new in this craft. Start with building shapes and volume on the jar and lid for roof. In below picture and video as well you see that I have wrapped tissue at the bottom of the jar. I did this because I don't want to see the aluminium foil from inside the jar. 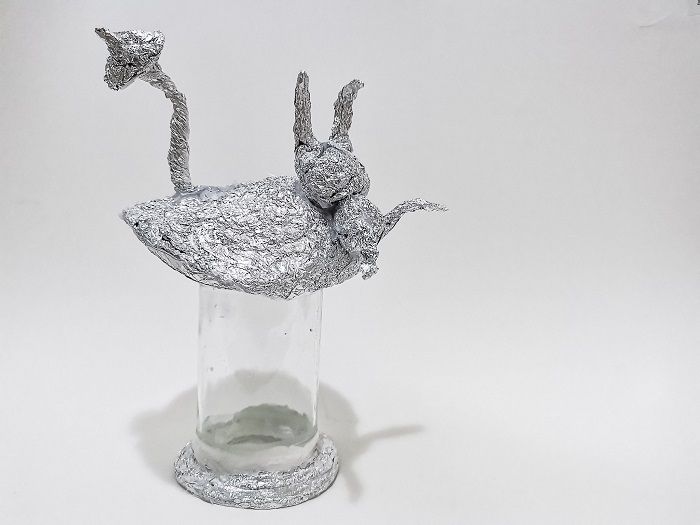 Make the mushroom roof and bunny shape with aluminium foil and secure each other with hot glue and hot glue gun. 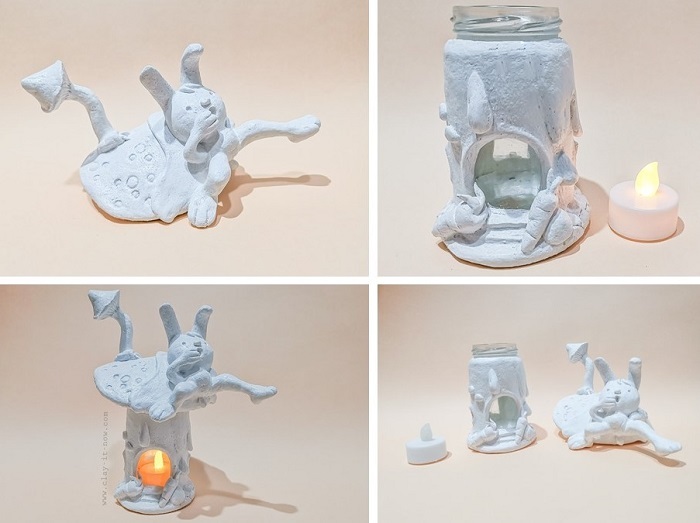 Once you are happy with all the shape you want for your Easter theme fairy house, cover the jar with air dry clay. and then cover the mushroom roof and bunny with clay too. In this project I use homemade clay because it's cheap, dry hard, easy to handle and I am used with it. Good news! if you want even cheaper clay, you can use salt dough too. I would say salt dough is an ancient craft material that has been used for ages and proven as long as you have right mixture of salt, flour and water. Too much salt will break the clay, it may fall apart once your creation dry and too much flour will make the clay soft easily in humid weather condition. I like making fairy house because the more I create imperfect house/ rugged house, the house looks more artistic and mysterious ha..ha..ha.. But, that's true! did you see how I purposely make dripping paint instead of making clean & tidy painting when finishing the fairy house? So, fairy house is really an easy craft and it's fun for kids projects or school holiday craft. Once you are happy with your design/ shapes, let the clay dry. After that, I apply a layer of white gesso universal primer to seal clay surface. After the primer dry, I paint my Easter theme fairy house with my favorite Easter color, yellow! Did you make this craft? would you like to share your work with us? if yes, please upload your pictures to Clayitnow Blog. Btw, if you prefer to watch above steps, I have uploaded the video to Clayitnow youtube channel. Happy watching!